Once the destination was decided, it was all about getting details sorted out for the Visa, picking up some foreign currency and finally putting a few things in the suitcase before hitting the road. 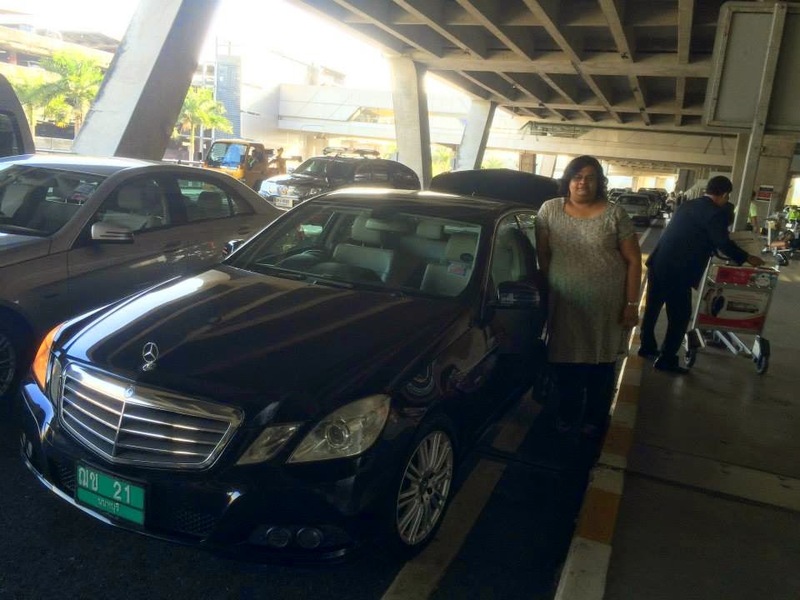 For Bangkok, visa is available in two formats- one you can get online visa and the other is Visa on arrival. It costs about 1000 [regular queue] or 1200[fast track line] Baht if you are doing Visa on arrival. I opted for this module and so went ahead downloaded the form from the net. It said I needed a photograph to be affixed on it which meant I had to get the photograph done ahead of time [ oh and in case you forget, there is a booth near the visa counter for instant photos]... While I was at it, I managed to exchange some money as well. Once we landed in Bangkok, we walked into the airport and saw a sign that said Immigration and visa with an arrow pointing to the left.. We went around the corner & were overwhelmed with what we saw. There were a million [yes I am exaggerating, but there were more than 200 ppl] milling around the area. Could not find a single person to help/give us guidance, we took place and stood in line. But I kept going round and round trying to find someone who could help and finally a lady told us that this was for people with Foreign passport and visa stamped already, but Visa on arrival was in another area down the lobby. I took the cue and walked down the corridor to the area that said "Visa on arrival", found a small crowd there. Stood in the line and it took me about 10 mins in total. The 1st person in the counter took my documents+photo+money and passport, gave me a token and asked me to go around where another lady took the token and gave me back my papers, I was then asked to stand in another line where a person sitting at the desk went through the documents and passport once again before stamping the visa on it.. Phew! I was done! Beyond this counter were the baggage collection conveyors. I was nearly the 6th and had to go all the way to the 15th to pick up our bags. All this while, my friend continued to stand in line with the millions around her and it took her a good 40mins to be done with it. By this time, I was done with the bags[found 2 of the 3 bags, went around the conveyor a few times trying to find her other bag, gave up and decided to wait for her]. Thus began our Bangkok vacation~!! I love travelling as most of you have guessed by now, even though I havent travelled as much as I would love to. 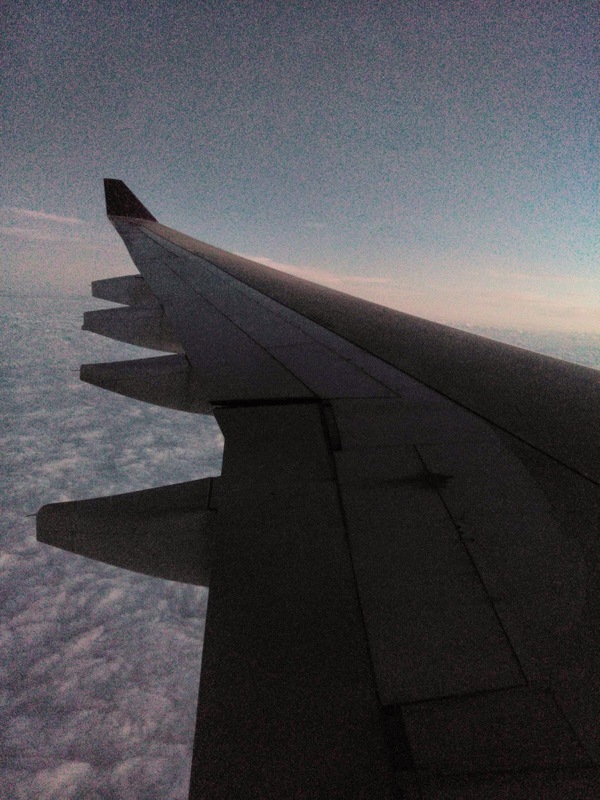 And when it comes to flying, then I instantly gravitate towards the window seat. This time too, luckily friend wanted Aisle while I happily chose the window seat and we settled in. From Chennai, the flight took off at the unearthly hour of 1.45am and it was to reach Bangkok around 6.25 which became 6.35am finally. 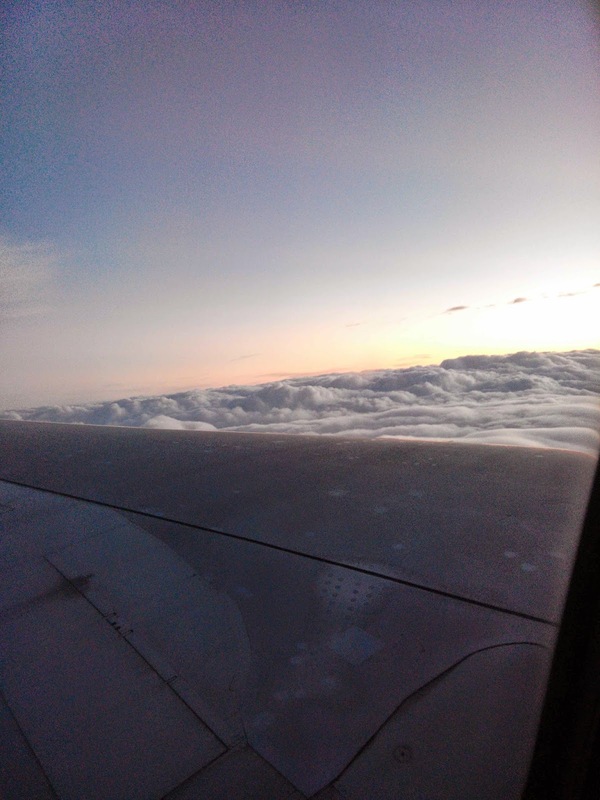 We boarded, got into our seats, got comfy, chit chatted a bit and that is when the stewardess came around asking all to shut the window. I wonder why they do that, there is nothing we can see anyways; it is pitch dark outside… Oh well! 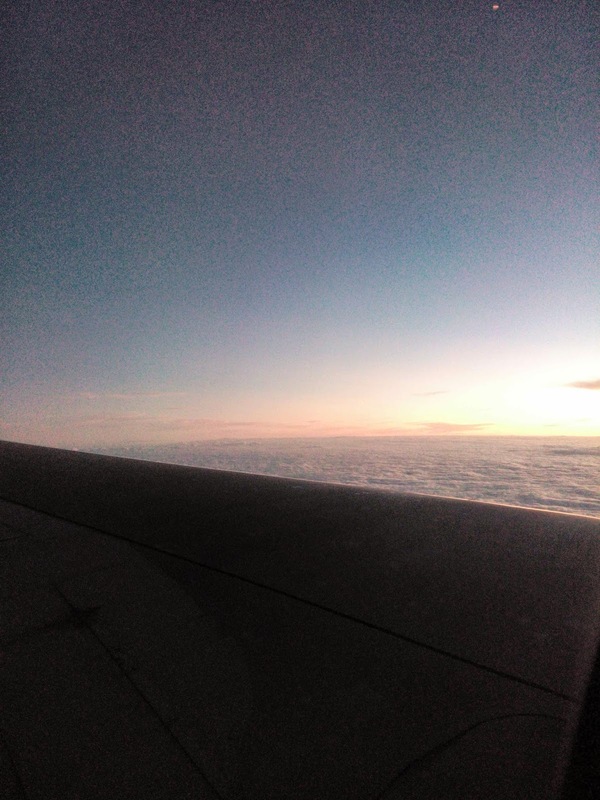 And then before I knew it, I had knocked off for about 4 hours, to wake up around 6 and see the sun rising above the clouds slowly. 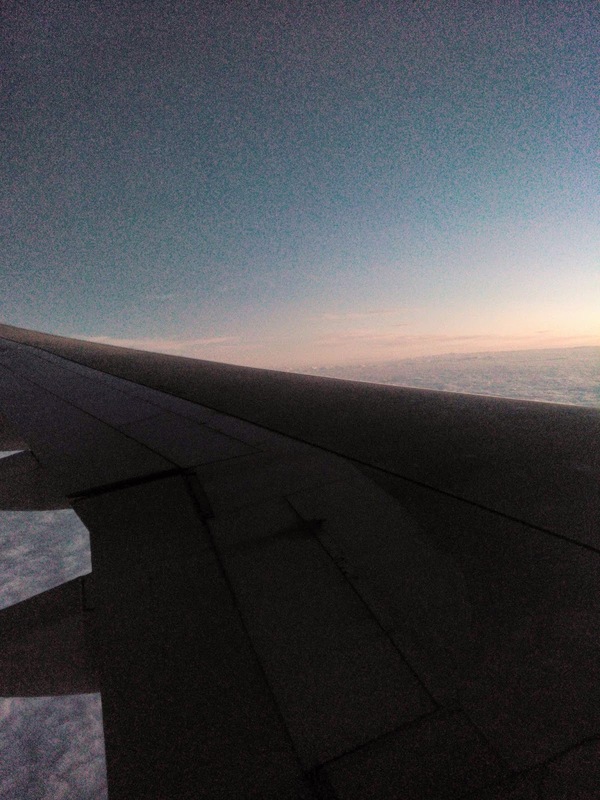 What a breath taking sight that was, the orange peeking into the white empty blue sky as we flew high above it all. 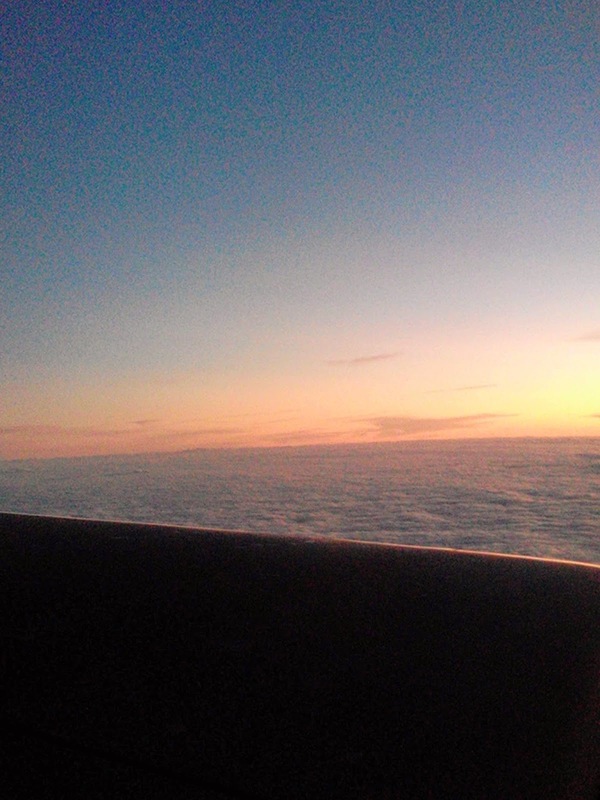 It was beautiful, for lack of better word..
A brand new day, a brand new destination awaited us on landing!! The BTS train, the Terminal 21 mall and wide open spaces.. What joy it was waking up to the glorious sky every morning. I had been dreaming of visiting Karaikudi for nearly 2 years and finally decided there came the day when I knew the weekend was free and ergo I made plans. A friend wanted to come along, so booked tickets for her as well. We reached early in the morning, checked into the hotel, had breakfast and the 1st place on our agenda was the "Pillaiyar patti Pillaiyar temple". When I had snooped around on the net I discovered that the temple was just about 12kms away in the town of Thirupatthur. This is actually an ancient rock-cut cave shrine dedicated to Lord Ganesha. 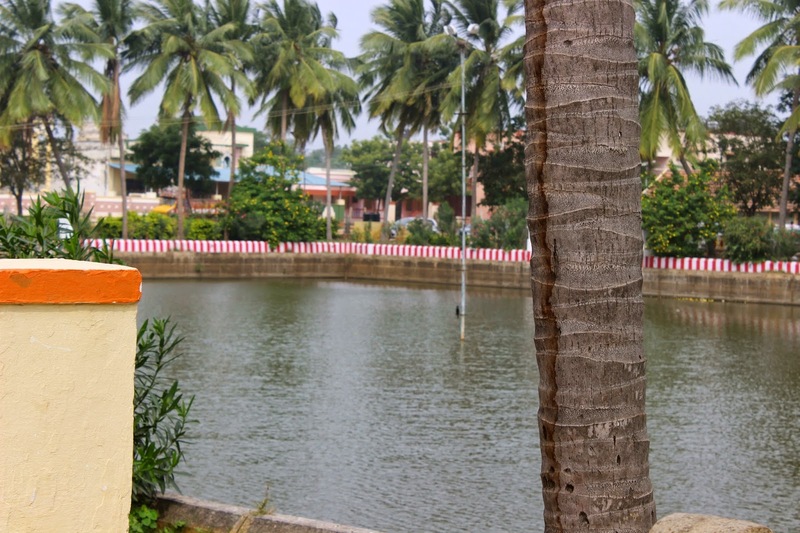 As we walked around the temple complex, we came upon the temple pond and a small mandap of sorts where many were resting, some doing a small family picnic of sorts. 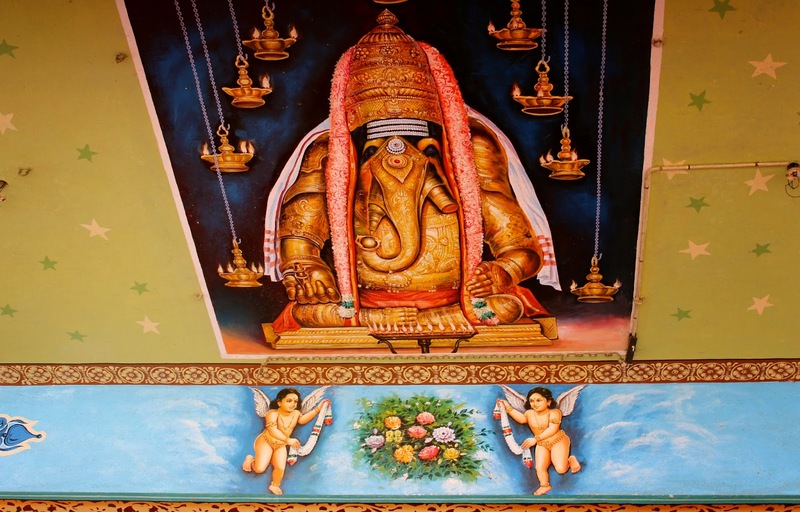 There are rock cut images of Lord Siva and other gods as well as a few shrines.This temple is most famous for the rock cut Vinayagar (Ganesha) sitting majestically inside a cave. The most unique thing about this temple is that Vinayaka appears with 2 hands unlike in other places where he is seen with 4 hands. Also he is seen seated without Angusapasam, with his legs folded and stomach not touching the Asanam in the form of "Artha Padma" Asanam. 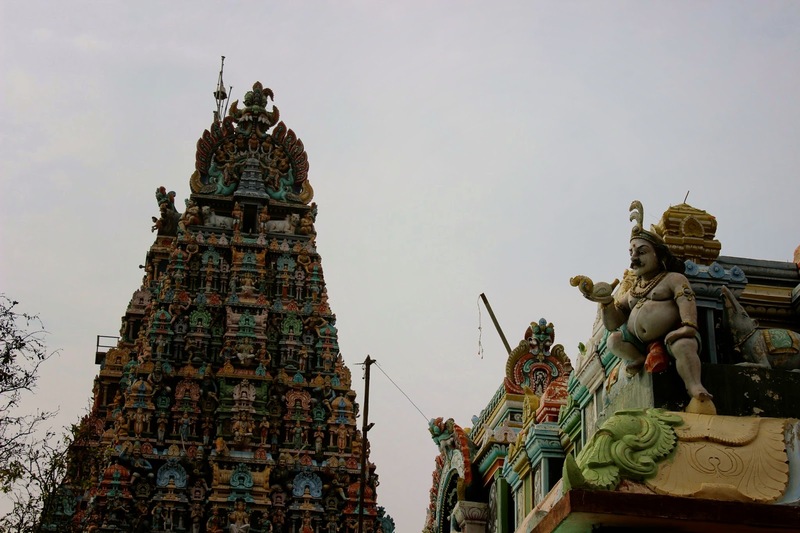 Like all Shaivite temples, Pillayarpatti Pillaiyar temple also has Lord Shiva as its presiding deity. Shiva is called "Arjunapureeswarar". Outside near the entrance is a small mount with a few rock cut steps that lead to a small shrine, we couldn't make out the name of the God there. Am loving the new turn of events.. When I was looking forward to welcoming 2015, I knew I was going to travel lot more this year but did not have any real plans in place. And then things fell into place and here I am all set to pack my bags once again. 6. There are quite a few beaches/water bodies around here..
One of the things I have decided to do in 2015 is to blog as much as possible, so here is the 1st post for the New Year! 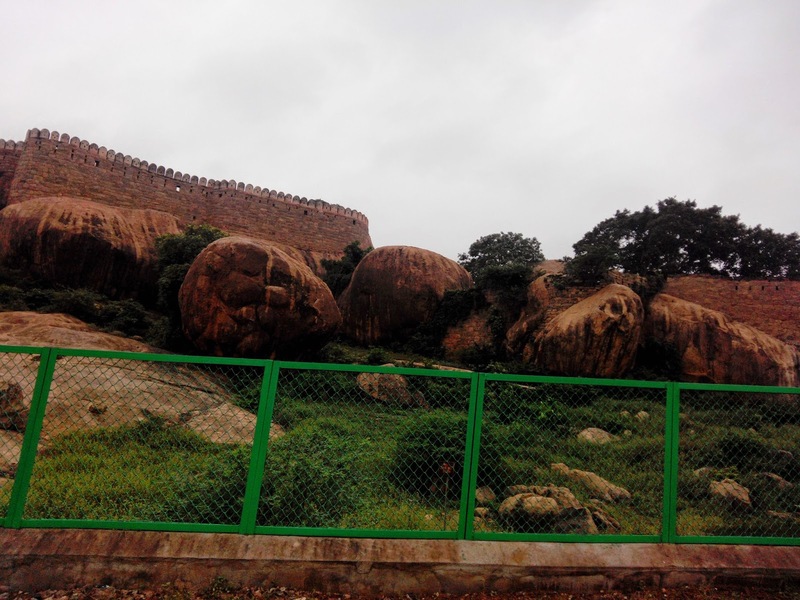 There was a gentle chill in the air, and quite the breeze as we drove down the highway, on our way towards Pudukottai (Karaikudi/Rameshwaram-Trichy highway)...And then suddenly the road turned and a giant fort wall came into view... It looked quite majestic and we could almost picture the rulers back in the days holding fort and fighting the enemies from the top. We also noticed a small canon outside a home, probably what was left of the fort area. 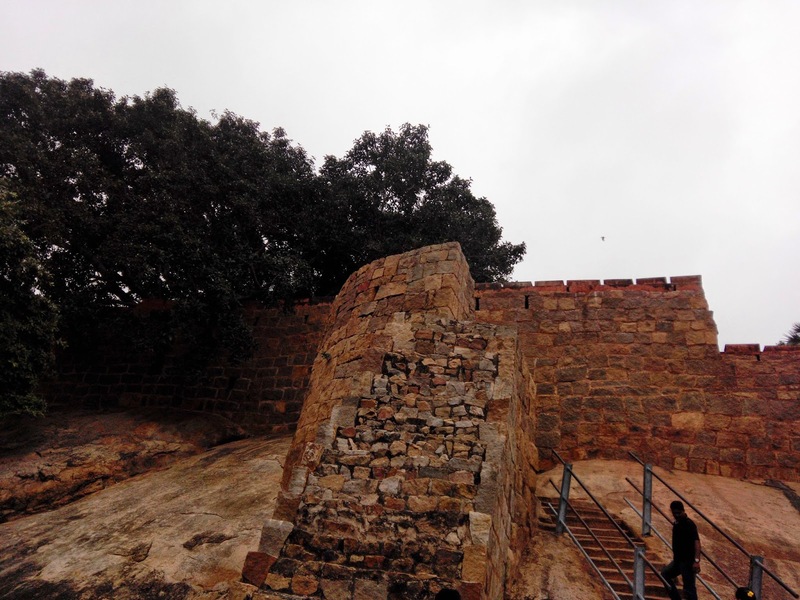 When I dug around for some information on the fort, came to know it had been built back in 1687 by Vijaya Regunatha Thevar, the Sethupathy of Ramanathapuram who was commonly referred to as Kilavan Sethupati. 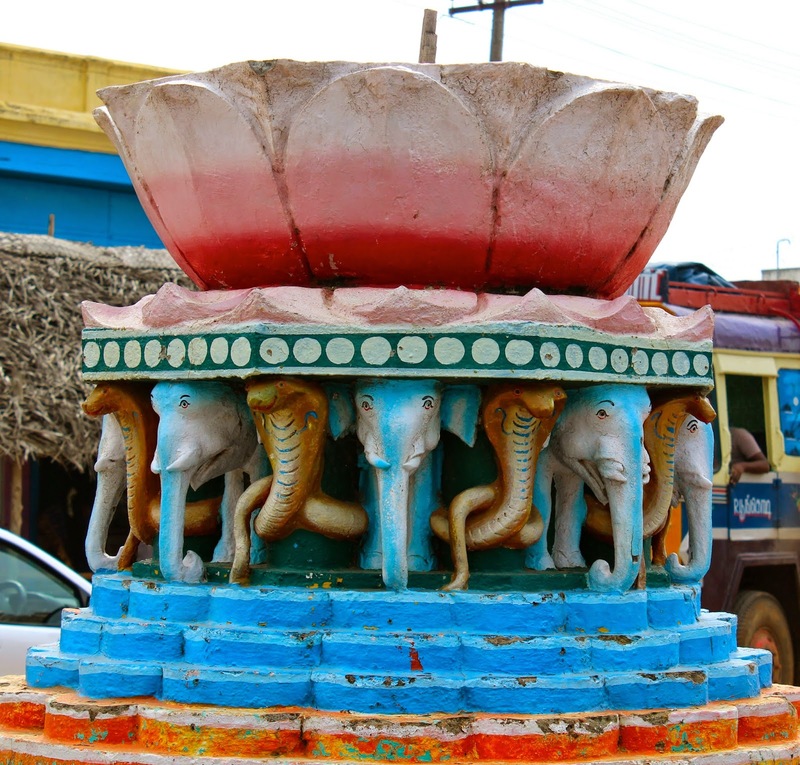 It was quite significant during the Tondaiman rule in Pudukkottai. This very fort was used as an arsenal by the British Army during World War II period. As with other forts, this too was large back in the day, with seven concentric walls and a broad moat all around. Today, only three of these enclosures remain. The fort has three entrances; one on the north, another on the south and third on the east. On the top of the rock is a bastion with cannon of British origin.Near the main entrance is a small pond. 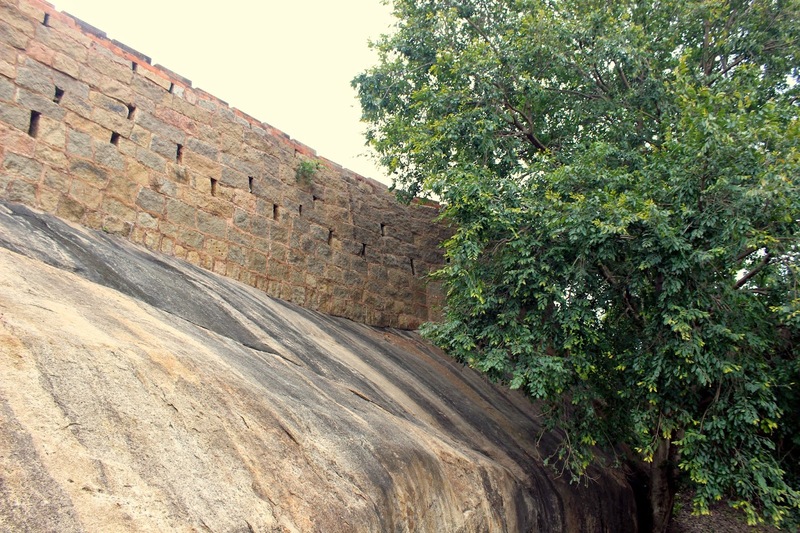 After Ragunatha Tevan, the fort went into the control of the Tondaiman rulers of Pudukkottai when Raghunatha Tevan gifted this fort and Thirumayam to his brother-in-law, Raghunatha Raya Tondaiman, the first king of Tonadaiman clan. The fort is very small and not many bastions are seen. There is one bastion on top of the hill where as canon of British origin is placed now. 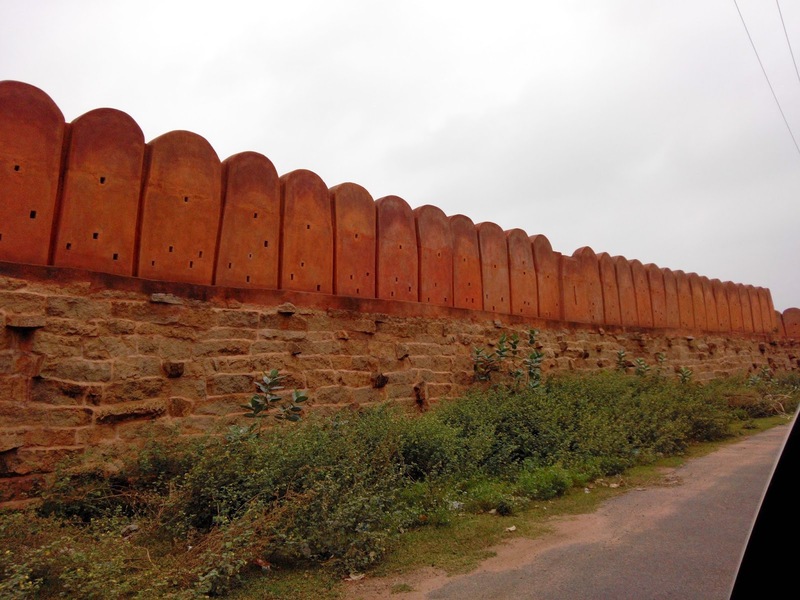 It is believed that Thirumayam fort was one of the recluse for the Tondaiman rulers during their bad times when Thanjavur general, Ananda Rao, ran over most of their territory leaving only small area in and around Thirumayam. 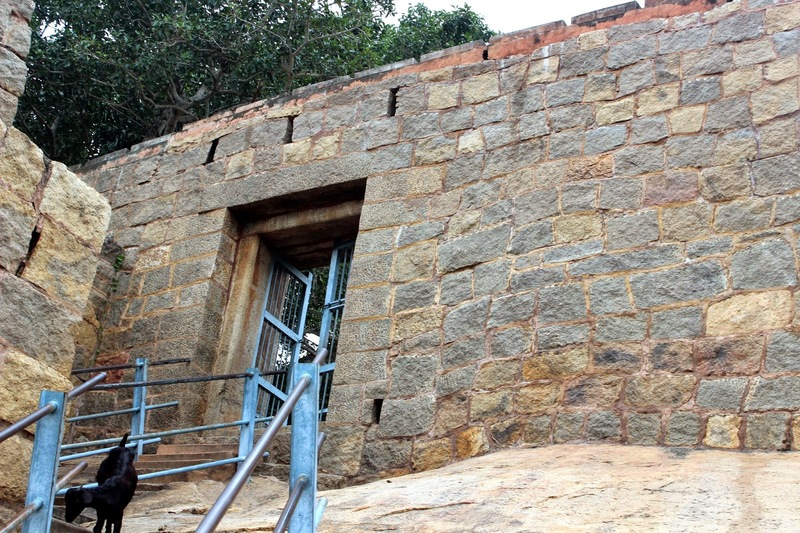 This fort is locally known as Oomayam Kottai, the fort of the dumb, dumb refers here to Oomayam who fought against the British and was executed later on. 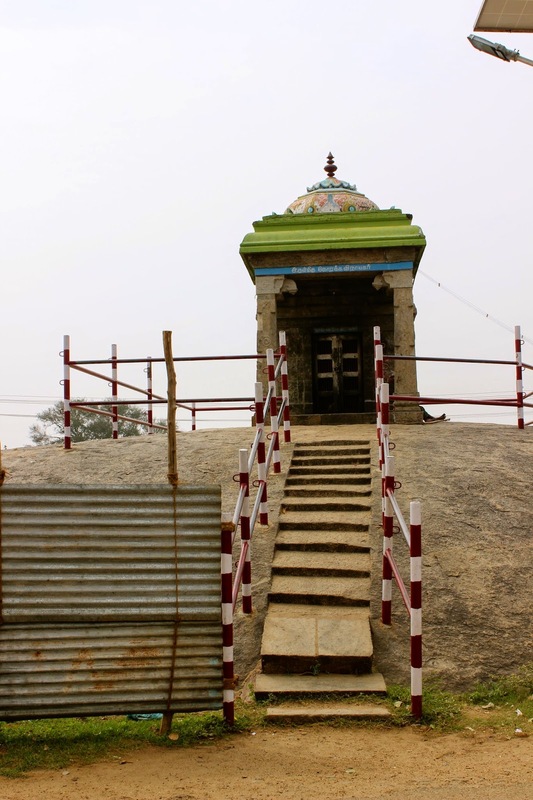 Our cab driver told us about the Sivan temple at the foot of the fort and the two rock cut cave temples which lie side by side -dedicated to Lord Shiva and Vishnu [the temples were built by the then Pallava kings]. The steps along the side of the mountain are all cut into the rocks and are quite slippery and steep.. It is quite an adventure getting up these. And then to go into the cave temple there is a man made steel stairway.